If you're a regular reader, you're familiar with my tendency to associate birds with characters. First, there was the Paulie Walnuts bird, and then the Dracula bird, but the granddaddy of them all, for me at least, is the jazz bird, the black crowned night heron. I first noticed this hep bird along the Rahway River, doing a bit of dusk-time fishing near a spillway (he was fishing, I was just walking by). Having never seen a heron of his type before, I took note of his distinguishing marks so I could look him up when I got home. It wasn't difficult to remember what he looked like: dark head, back and bill, lighter gray wings and a white underbelly, and yellow legs. Oh, and he was crouched over like a grizzled jazz saxophonist with bad posture. Given the fact he didn't seem to have much of a neck, he kinda reminded me of Bleeding Gums Murphy from The Simpsons. I figured he was probably a heron, given his patient, nearly motionless and deliberate approach to fishing, but he looked very little like the lean and graceful great blue herons that sometimes show up in the same area. This particular bird became a regular fixture on my nightly summertime walks near the Rahway, usually fishing at the same spot unless a human was already there with a rod and reel. There's something very meditative about watching a heron, and this fella has a sort of happy expression on his face, if birds can show emotion. 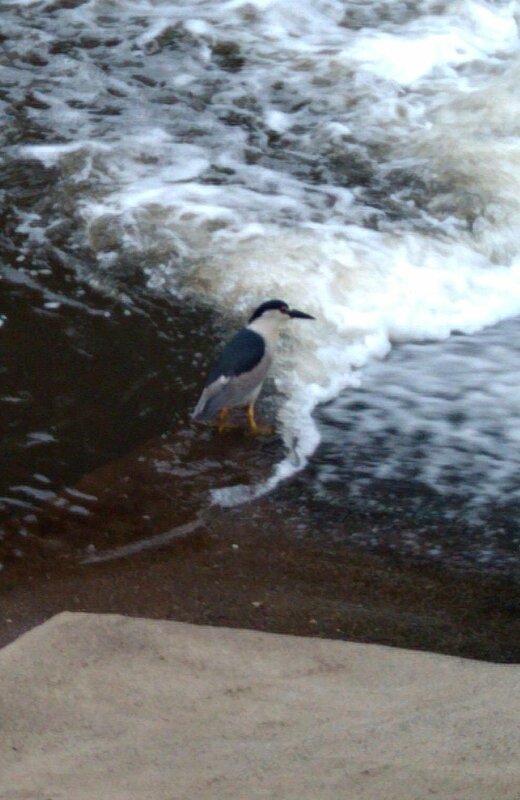 Not long after Ivan and I met, I mentioned the jazz bird and where he hung out, and somehow we decided to dub the night heron "Clyde." It seemed as good a name as any, even though we had no idea whether the bird in question was male or female. Apparently the only ones who can tell the difference are other black-crowned night herons. If memory serves, Clyde usually shows up in May and hangs out until September, so I'm hoping he'll be back in the next couple of weeks. We didn't see him after Hurricane Irene swelled the Rahway several hundred feet beyond its banks late last summer, but I've got to believe he made it through the storm okay. I'll keep you posted. And maybe when I see him again, I'll bring my sax over to the river and give him a little serenade. Riverside blues by moonlight... what a way to do one's birding.